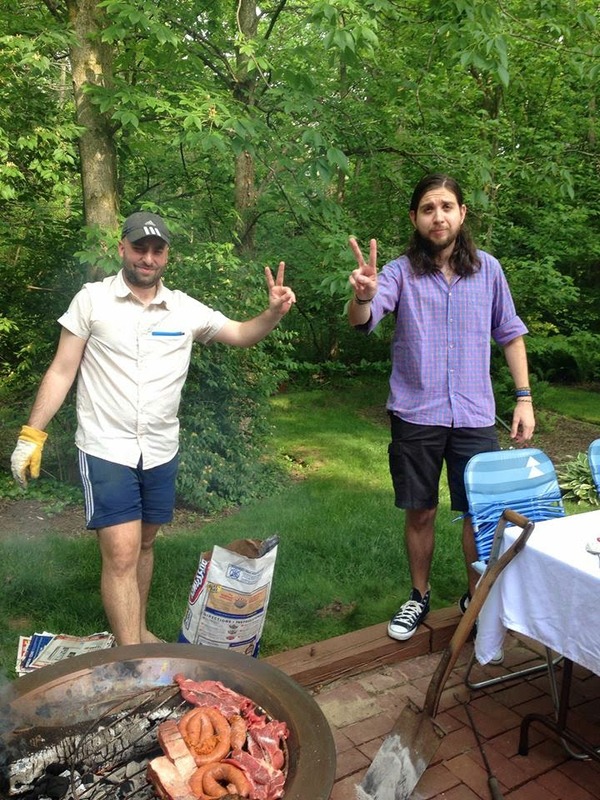 A couple of weeks ago we were thrilled when our friends from Argentina, Lucas and Sergio, were able to visit and give us the gift of an Argentine cookout. They were here in the United States to present a paper at a symposium in Chicago, so when the conference was over they journeyed just a bit more to visit us. Lucas and Sergio grill out just about every weekend when the weather is good; it's an Argentine tradition. Roy, Allison, and I took them to a huge carniceria or meat market. The grill guys were excited to find cuts of meat similar to what they were used to back in Buenos Aires and we bought 20 pounds. When we got back home, Sergio started to prepare the fire with Lucas as his assistant. No gas grills for these two! Sergio used straw and crumpled up newspaper to get logs going, which in turn got the charcoal to just the right temperature. The rule here is low and slow with the thinner cuts of meat getting done first. I can't show you one photo of a beautiful plate with all the dishes we sampled because the food eaten at an asado is served in stages as it gets done. The first course is usually grilled provoleta or provolone cheese served with bread and olives. Next comes the first meat to be done, chorizo sausages, which are served with chimichurri sauce. I love chimichurri with steak, but Argentines usually serve this cilantro/parsley mixture with the sausage. The rest of the meat is served as it gets done along with ensalada Rusa, a potato salad with peas and carrots, and grilled vegetables. We also had grilled (I used the gas grill for these - gasp!) peppers with an egg cooked inside them. Often a simple salad of lettuce, carrots, onion, and maybe tomatoes is sometimes also served. Lucas and Sergio like just a squeeze of lemon for salad dressing. We loved this relaxed style of eating and entertaining; it's conducive to great conversations and strengthening of friendships. Thank you Sergio and Lucas for sharing this with us! The only seasoning Lucas and Sergio used was a bit of coarse salt. They explained the cuts of meat to me as costilla de vaca y puerco (beef and pork ribs), lomo de cerdo (pork loin), chorizo de puerco (pork sausage), and diezmillo (thin chuck steak). Sergio used our two portable fire pits and a shovel to keep moving the charcoal around so he could get the fire at just the right temperature. Sergio said he had taken an active part in asados since he was 16 - even before he could drive! 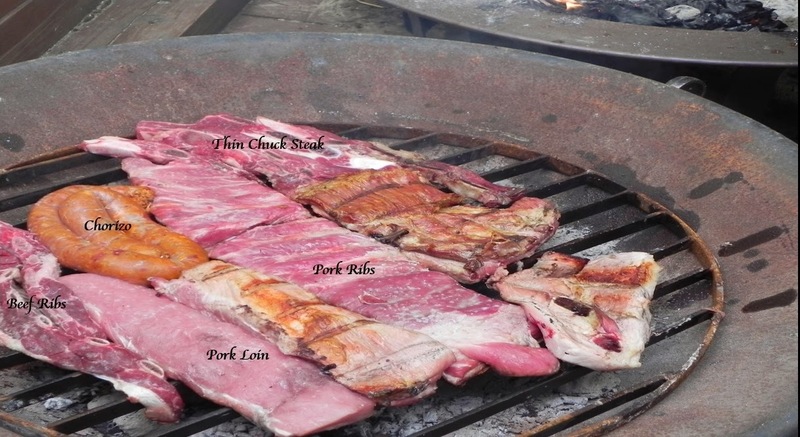 For the men in Argentina, tending to the cooking of the meat in an asado is truly an art! The chorizo and the thin chuck steak were done first. Next came the pork and beef ribs. Finally the pork loin was done. Seed and finely dice the peppers and set aside. Put the cilantro and the parsley in a food processor. Add the vinegar and olive oil and blend just until the herbs are roughly chopped. Avoid turning them into mush. Transfer the herb mixture to a bowl and stir in the pressed garlic, diced Serrano, diced red bell pepper, and the oregano. Store in the refrigerator until ready to use. Gently combine all the ingredients together. Serve at room temperature but store in refrigerator. Wrap the bread in foil. Brush both sides of the cheese with the olive oil. Rub in the herbs and red pepper flakes (I did not use the red pepper flakes) or lay the fresh herbs on top. Place in a oven safe dish and heat on the covered grill five minutes or until melted and spreadable. Heat the foil wrapped bread on the grill at the same time. (I used some aged provolone cheese that was sliced over an inch thick. Initially, I threw it right on the grill because I was hoping for grill marks. I did get some indentations, but had to pull the cheese off and put it in a foil pie pan because I could see it was just going to melt through the slats.) Everyone loved this and I ended up grilling three hunks of cheese. Open the package of frozen peas and pour them out in a bowl. Set them aside, they will thaw during the rest of the preparation time. Peel the potatoes and cut each into 4 to 6 chunks for cooking. Place in a pot and cover with water. Cook over high heat until boiling, then reduce the heat and cook for about 5 minutes more or until a fork can pierce them easily. They need to be soft but not mushy. When they are done, drain them and run very cold water over them to stop the cooking process and cool them down. Cut them into smaller, bite sized squares and place them in the bowl with the peas. Peel the carrots and slice them. Put them in a pan and cover with water. Cook over high heat until boiling, then reduce the heat and cook for about 5 more minutes or until a fork can pierce each carrot piece easily. Drain them and run cold water over them as well, then transfer them to the potato/pea bowl. Sprinkle the vinegar, salt, and pepper over the vegetables. Gently mix in just enough of the mayonnaise to coat. Refrigerate until ready to serve. Cut the eggplant, zucchini, yellow squash, and red onion into 1/2 inch slices. Core and seed the peppers and cut them in half. Brush both sides of all the vegetables with olive oil and sprinkle with salt and pepper. Grill over medium heat, 5 minutes per side. Cut the peppers into smaller pieces. Place on a serving platter and drizzle with balsamic vinegar. Core, seed, and cut each pepper in half. Brush both sides with olive oil. Place cut side down on medium heated covered grill and cook for 5 minutes or until the pepper is softening. Flip the peppers over and brush each inside with the pressed garlic. Sprinkle each one with 1 tablespoon of mozzarella cheese. Crack an egg into each one. Cover the grill and cook about 5 more minutes or until the egg is set. Later, Sergio told me the cheese is usually sprinkled on top as well.